My iCloud storage is beginning to approach its limit, thankfully, there are options users can utilize Microsoft OneDrive to overcome the annoyance. My iCloud storage is beginning to approach its limit on my Apple iPhone, thankfully, there are options users can utilize to overcome Apple’s meager cloud offerings. When you jump into the Apple ecosystem, especially in 2016, the company is looking to drive growth in services; you can only expect to be nickel-and-dimed along the way. The devices are expensive enough already that it seems unreasonable Apple really would expect users to pay more for cloud storage on devices that are capturing 4k pictures and 1080p videos. The disadvantage when you stray from Apple’s offerings is the lack of seamless integration. iCloud for all its faults, it works, especially when it comes to syncing. Until Apple increases its cloud storage defaults, I think it’s best to consider another service to supplement it. One viable option is Microsoft’s OneDrive. I am already invested in the service for storing all my Office documents; why not take the leap where other personal media is concerned? 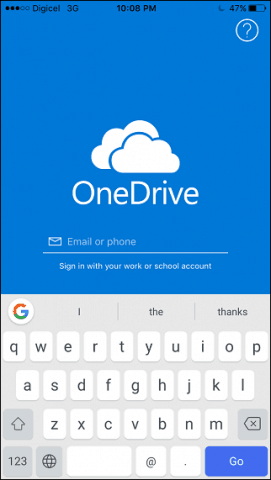 The OneDrive mobile app makes it easy to set up and your camera roll to automatically upload, so if the worst happens, you always have a backup copy. If you took advantage of Microsoft’s Camera Roll bonus earlier this year, you should have 15 GB of free storage just for your photos. In this article, we show you how to set up and use it. Launch OneDrive on your iOS device, if it’s not installed, it’s a free download from the App Store. You will also need to have a Microsoft Account to sign in and use the service; so make sure you have one setup. If you are using Office 365, you can also use your account to sign in and upload photos to OneDrive for Business. Tap the Photos tab to access your photo library. If OneDrive prompts you for access to your Photos, tap OK. Tap Turn On next to the Camera Upload menu and then wait while OneDrive prepares to upload your photos. Depending on the speed of your network and the size of your library, this can take some time. You can monitor the progress as it counts down to the very last photo. That’s it; your pictures are now uploaded. You can also access and sync your photos from any other device running OneDrive. If you are not a fan of OneDrive, there are other cloud services to choose from. Dropbox, while limited on the storage side includes photo upload option with some exceptions. Google’s Photos is probably the best there is for storing lots of pictures. The service offers up to 15 GB of free online storage and works seamlessly with your iOS camera roll too. You can also configure Google Photos to delete your locally stored photos if you are using a device with limited space, like the 16 GB iPhone. Ultimately, it depends on which service you like using, but these are options you can consider if iCloud meet its limit. Are you using any of the services mentioned? If so, tell us what you think in the comments. Also, for other devices, make sure to check out our article: Auto Back Up Your Photos to OneDrive from Any Mobile Device. I would like to delete the camera roll pictures, but maintain their existence on One Drive. Do I need to create another folder and move them there? I am close to my storage limit on my iPhone. It’s not two way sync. You can delete them from your phone and they will remain on Onedrive. It’s awesome. It’s how I keep all Apple devices photos and videos in my home backed up to a single OneDrive gallery. It’s also great for sharing photos. Steve, thanks for the reply, but I tried deleting a picture from my camera roll, and it deleted that same picture in One Drive also. Maybe there is some special setting of which I am unaware? Let me test it out again on my phone and get back to you. Just to confirm – when you DELETE the photo from your phone, be sure to do it from the built-in iPhone / iPad photos app. Not using the OneDrive App. I just confirmed, on my iPhone, I can blow away photos in my Photos App (built-in iPhone Photos App) and they are not touched on my OneDrive account. I tested this on several devices. These comments are not the best for troubleshooting – Perhaps you can post your question on our free Support forum – https://windows10.help/. Better threaded comments and you can add screenshots. Steve, It worked! I was deleting the photos through the OneDrive app on my iPhone, not the Apple Photos App. Thanks for the help! I really appreciate it! Thanks for the updates Mike. I’m sure this will help others on the blog. Steve, do you know a way to change the destination folder in One Drive in a way that my photos are uploaded to a different place? Would be great if I could configure that. The short answer is no. The OneDrive Auto Upload feature doesn’t allow you to specify where the images go. They are all just copied to the same folder. What I like to do is, after upload, either delete what you don’t want, move them to separate folders or, create albums from them. The album feature is the best way that I’ve found to curate the photos and make them easy to find/track/share. Thanks a lot for the fast reply, Steve! I think that’s really a bit unfortunate and hope for an implememtation of such a feature in the future. This is not syncing the videos. Only the photos. is there a way to get videos synced as well? Yes – Under the Camera Upload menu, just tap “Include Videos”. Hello! Hoping you can help me! I have an iPhone 5c. For ages now, when I plug it into my laptop it doesn’t recognise that there are any photos in it (Or maybe just 1 or 2). I want to back up my phone photos, so I signed up to icloud so at least they would be stored, but I can’t figure out how to get them off icloud onto my PC without just uploading them one by one… I read your article and thought I’d try onedrive. I downloaded the app, and selected camera upload, but it just seems to have a made a random selection of photos to upload (about 20), and it doesn’t seem to recognise that there are any more on the camera roll (there are about 30000!). Any thoughts? I’ve tried so many different things and I just can’t get these photos onto my PC! Any advice very gratefully received. new to one drive and laptop sharing etc. as I’ve always just kept them on my phone(3000) photos and I thought it time to store them on a laptop/flash drive in case I lose them. my one drive storage (free)is 5gb and its taking AGES to transfer to 3000 photos, I started this yesterday evening and its only uploaded 1000 photos so far. do I just need to bare with it and accept I’m transferring a lot of photos or will buying premium at 5.99 per month for 1TB help? I would make sure you’re on WiFi. From there, performance will normally be a subject of age of phone (CPU Power) and speed of WiFi. The good news is, once this first big push is done, the photos will be backed up and net new photos should be kept up-to-date fairly quickly. My iPhone photos and videos are set to upload to OneDrive using the app, but the live photos are converted to regular jpgs. When I download selected live photos into my iPhone, they’re just regular images. Did I just lose my Live Photos?